1) Place the butter in a large mixing bowl with the caster sugar. Using a wooden spoon beat until light and fluffy. Gradually beat in the egg until well mixed, then gradually add the flour. Use your hands to bring the mixture together to a stiff dough. Gather into a ball and chill for 30 minutes. 2) Heat the oven to Gas 4, 180°C, fan 160°C. Roll out the dough on a work surface lightly dusted with flour until it’s the thickness of a £1 coin. Using an oval cutter (or a cardboard egg-shaped template), cut out egg-shaped biscuits, using rolled out trimmings to make more. Place on baking trays and bake in the oven for 6-10 minutes, depending on size, until just golden brown. 3) Allow to cool for 5 minutes before removing from the baking tray to cool completely. 4) To decorate, make up the icing as directed on the packet. Divide between 3-4 bowls adding a little food colouring to each bowl. 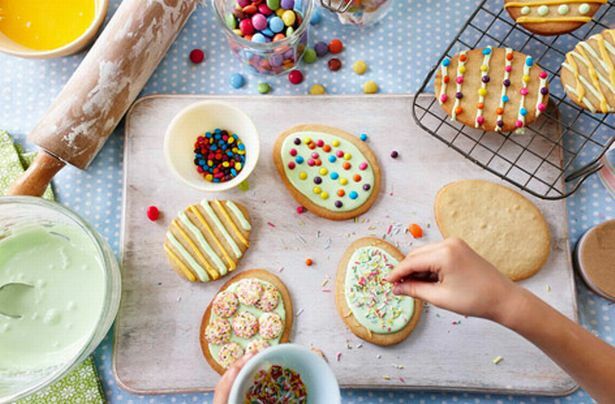 Place the mixture into piping bags and decorate biscuits as liked – kids may like to use sprinkles or sweets too.